Timbercraft Premium Bamboo Bathtub Caddy Tray will make the perfect addition to you bathroom. With Timbercraft it is all about *Luxury*Luxury*Luxury*. Our 100% natural bamboo Caddy is constructed with the highest quality craftsmanship and double treated with waterproof lacquer preventing water and mildew damage so your tray will last for a long time. Wash the day away and indulge in Luxury with your own private Spa like bath. There is no better way to unwind and rejuvenate your inner engine. Features - Adjusts from 27.5 inch to 42 inches wide to span almost any tub. 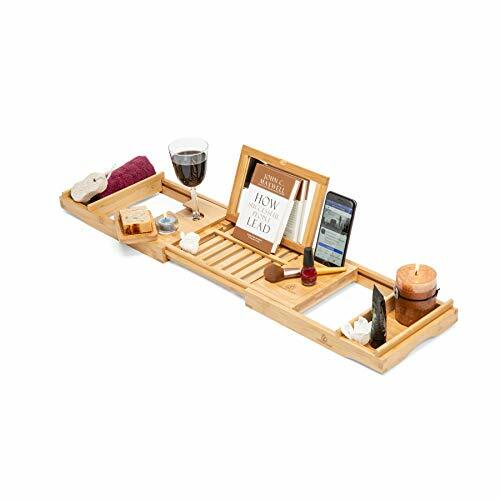 - Large Mirror that folds down and doubles as a back rest for your favorite book or tablet - Wine Glass Slot, Phone Slot, Removable side trays, Anti Slip relief cuts, 100% Natural treated Bamboo - As a Free gift to you we have included a matching Bamboo soap dish. -This is the perfect gift for that special someone in your life. --Buy one for you and them. -100% money back if your not completely satisfied. ~Supreme Functionality & Beauty As We Have Included A Large Mirror That Doubles As A Backrest For Your Favorite Book Or Tablet. Perfect For Applying or Removing Makeup, Shaving, Or Trimming Eyebrows. ~Your New Timbercraft Bathtub Caddy Will Span Most Tubs From 27.5 Inches To 42 Inches Wide With Our New Anti-Slip Design So All Of Your Things Stay Where You Want Them. ~Truly The Perfect Gift For Any Occasion. 100% Money Back If Your Not Completely Satisfied. If you have any questions about this product by Timbercraft, contact us by completing and submitting the form below. If you are looking for a specif part number, please include it with your message.